This is my week's menu. I will post the recipes for the items highlighted with an * as the week goes on. I do a whole week at a time, but to start with, you can just do supper for a week, or just main dishes. Whatever seems manageable to you. Today I am sharing the breakfast recipes. 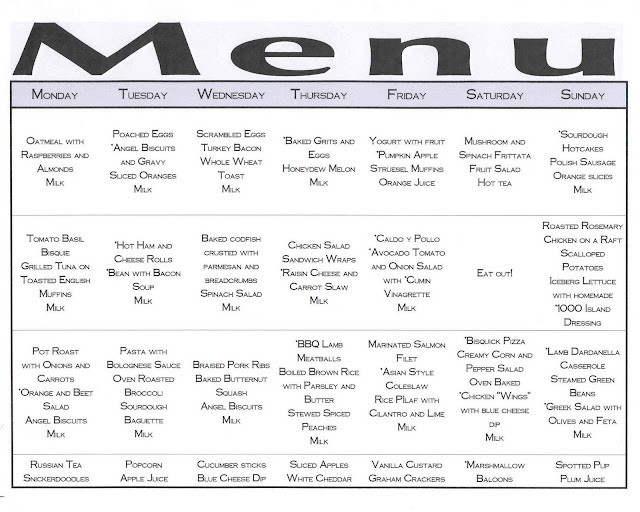 When I learned how to plan menus, we lived far enough from town that we only shopped once or twice a month. I had to plunge in head first, and it was overwhelming at times. I got a system down, and already had experience with keeping a well stocked pantry, thanks to my mother. We were lucky enough to have chickens where we lived, and a milk cow, so I had ready access to milk, eggs, and the ability to make cheeses and butter. In the summer, I had a big garden, and I canned as much of our produce as I could for the winter. We lived very well, and very cheaply then. It became a habit to live this way, and I found once I was organized and confident about what I was doing, I really saved a lot of time in the long run. Mix well, and keep in an airtight container for up to 2 weeks. To use, pat out a batch amount on a floured board, cut with a cutter, and bake at 400*F for fifteen minutes. You can let these rise for fifteen to thirty minutes also. For best results, bake on a pizza stone. I have included these biscuits in several meals. It is so nice to have these on hand, and they are very much superior in flavor and tenderness to store bought cans of biscuits. Pat out angel biscuits, and cut with a standard size cutter. Brush with melted butter and cinnamon and sugar on one size, and place a large soft marshmallow in the middle. Pinch dough around the marshmallow, and bake in a muffin pan at 400*F for fifteen minutes. The marshmallow will dissappear, leaving a wonderful spicy filling inside. We are having these for a snack, but they are good at breakfast. Boil grits according to the package directions, but substitute the amount of milk or water with chicken stock. Add a T of dried parsley at the end of cooking, and stir in 1/c C cream cheese, salt and pepper to taste. Pour into a greased baking dish, and top with raw eggs. Sprinkle with parmesan cheese, and bake in a 400*F preheated oven until eggs are just set. Combine wet ingredients except apple. Sift together dry ingredients, and add to wet. Fold in apples, and spoon into muffin tins lined with paper. Top with streusel topping. Bake in preheated 350*F oven for 35 to 40 minutes. cut in butter to other ingredients and top muffins before baking. The recipe calls for 1 1/2 C buttermilk, but due to varying thickness of sourdough starters, I use it as a guidline, and usually add more than it calls for to make a good batter. This is a quick version of sourdough omitting the need to make a sponge the night before, and then add part of the sponge back into your starter. I don't like having to make the sponge, so I use this batter. It is delicious! I think the perfect combination for eating sourdoughs is with real butter, and chokecherry syrup.